TDS ON SALARIES FOR FY 2016-17 AY 17-18 U/S 192 INCOME-TAX ACT-1961. Rs 5,00,001/- to Rs. 10,00,000/-. Rs. 20,000/- plus 20 per cent of the amount by which the total income exceeds Rs. 5,00,000/-. 20 per cent of the amount by which the total income exceeds Rs. 5,00,000/-. An additional education cess is chargeable at the rate of one percent of income-tax including the surcharge if any, but not including the Education Cess on income tax . Finance Act 2013 provided relief in the form of rebate to individual taxpayers, resident in India, who are in lower income bracket, i. e. having total income not exceeding Rs 5,00,000/-. The amount of rebate available under section 87A is Rs 5000/- or the amount of tax payable, whichever is less from AY 2017-18. 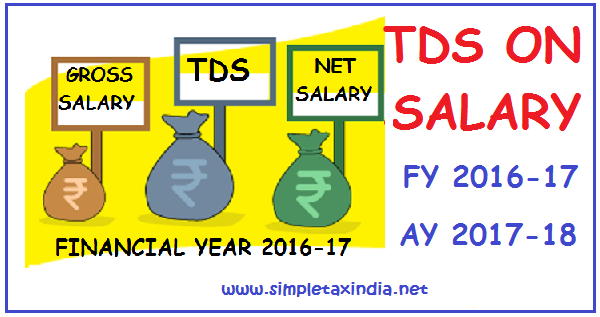 SIMPLE TAX INDIA: TDS ON SALARIES FOR FY 2016-17 AY 17-18 U/S 192 INCOME-TAX ACT-1961.